I have yet to share with you my favorite restaurants in New York. It is always a work in progress because there are so many to choose from and there are always new ones opening. Over the next few days, I am going to do my best to narrow down my list, starting with my favorites from our recent trip. Once again I researched which restaurants were "hot" in 2012. I wanted my restaurant list to stay current so I refused to go to any restaurants I had already been. I was not disappointed with my selection. I loved Saxon + Parole, a British restaurant on Bowery. The ambience alone is worth going here for. Everything we ordered from start to finish was delicious! Don't miss the mushroom pate to start. This restaurant books up fast but you can make a reservation on Open Table so be sure to do that if you want to avoid a wait. The next restaurant we went to was Red Farm. This is a trendy, new Chinese restaurant in the West Village and they do not take reservations. I figured if we got there at 9:30pm on a Tuesday night, our wait would be minimal. I was wrong. We had a 1.5 hour wait so we did not end up eating until 11pm. I recommend either going right when they open, 5pm, or leave your name and phone number and they will call you when your table is ready. You can kill time by going to The Other Room or Little Branch for drinks. As far as the food goes, I recommend starting with the pastrami egg roll. It is to die for and they serve it with this yummy honey mustard sauce. Next, I recommend ordering the soup dumplings or the 'Pac Man' dumplings. 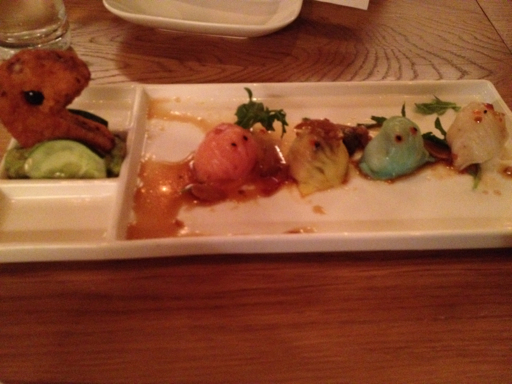 The 'Pac Man' dumplings were nothing special but the presentation alone is worth ordering them! For an entree, we split the shredded roast duck noodles which was more than enough for 2 people. We left here very satisfied but it is still hard for me to justify waiting almost 2 hours to eat chinese food! Rubirosa, located in Soho, is a rustic Italian restaurant that cannot be missed. We ordered a small arugula pizza as an appetizer which you should definitely get. The pastas were all amazing but the standout was the black and white tagliatelle with mixed seafood. Portions come in either small or large and the large portions are meant for sharing so keep that in mind when ordering. This restaurant takes a limited number of reservations on Open Table but it is worth it if you want to ensure a good table. The last restaurant that we ate at that is also worth checking out is Hudson Clearwater. It is an unmarked restaurant located on the corner of Hudson and Morton Street. Although the restaurant itself is small, they will accommodate larger groups as I went here with a group of 6. They served delicious specialty cocktails in addition to solid American food. Tomorrow I am going to share with you my favorite breakfast, brunch and lunch spots in the Big Apple! love this post--just made a reservation for saxon and parole!